One of the inaugural steps in preparing Royal Navy sailors to man the first of the Queen Elizabeth Class carriers due in 2016 has been taken with the opening of an engineering development facility. The 65,000 tonne carrier - which weighs three times as much as HMS Illustrious - is currently being assembled at Babcock’s dockyard in Rosyth and will be able to take up to 40 aircraft, almost twice the current capacity of a carrier. Under the programme, part of HMS Queen Elizabeth’s state-of-the-art mission system has been pre-assembled at HMS Collingwood in Fareham, Hampshire. 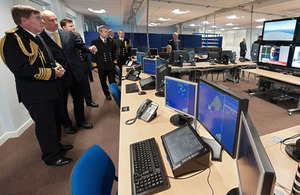 The result is a physical representation of the aircraft carrier’s Operations Room and Flying Control Centre. As the ‘brain’ of the ship, the mission system brings together air traffic control, navigation, tactical picture compilation, communications and mission planning for the embarked F-35 Joint Strike Fighter and Merlin helicopters. It will also provide engineering and logistic support. The facility will hold engineering tests and trials using the same equipment that will eventually be installed on the ship in Rosyth. Being located in HMS Collingwood it has the benefit of allowing the establishment’s Royal Navy trainees to take part in large scale trials. By manning every operations room position with Royal Navy personnel ensures the equipment can be tested and loaded to its full capacity - something that has never been done before with previous mission systems. Named after Admiral Sir Lumley Lyster, the mastermind behind the Taranto raid and architect of the Royal Navy’s carrier strategy during the Second World War, Lyster Building at HMS Collingwood marks the collaboration between the Aircraft Carrier Alliance, Navy Command and Flag Officer Sea Training. Admiral Lyster was a leader and innovator in delivering air power from the sea and this will be the primary role for the Queen Elizabeth Class carriers as part of our Future Navy 2020 vision. It is apt therefore that the Aircraft Carrier Alliance should take him as their inspiration in developing this world-class engineering and training facility that will help ensure HMS Queen Elizabeth enters front line service before the end of the decade. The equipment used in Lyster building will be moved to the HMS Queen Elizabeth once personnel have been trained in a bid to keep costs low. The first Royal Navy weapon engineers are set to join the carrier in 2013 in Rosyth.